The first petrol powered engine that never needs an oil change - ever*. All you need to do is Just Check & Add™! Lightest in class for easy to use, manoeuvre and store. Needs no oil change - just check and add as needed. An advanced powerful OHV platform that runs quietly and smoothly. ReadyStart® Starting System: No prime, no choke just pull for power. The new InStart® system is also available. The EXi SERIES delivers the optimum power to weight ratio. *Regular maintenance still required. To see complete details refer to your Operating Manual. 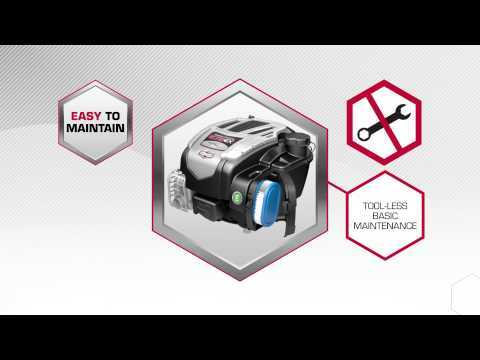 Briggs & Stratton standard warranty terms and conditions apply. Just Check & Add does not extend the warranty period. See our warranty information for details. Goodbye oil changes, hello easy. You value your time - and any time saver that makes life easier. No more time consuming, messy oil changes and worries about disposal.